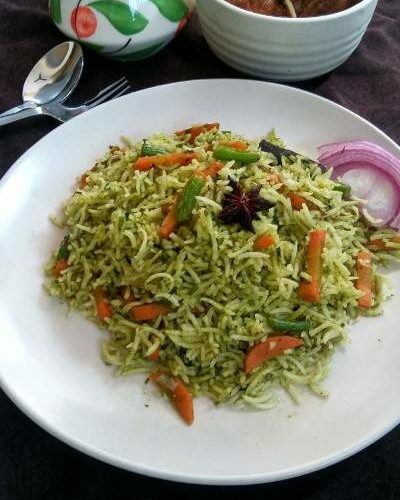 Coriander rice | Cilantro rice recipe is a simple, mildly spiced, flavorful rice made with fresh coriander leaves, whole spices and some vegetables. It can be served alone just as it is or with raita or any spicy curry of your choice. It can also be packed in lunchbox too. 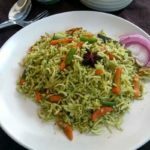 This coriander rice is easy and can be made without much hassle. Chopping of the vegetables just takes some time. Other than that, it gets done quickly, provided you have cooked the rice in advance. I always love adding fresh herbs in my cooking. They are not only nutritious but also lend freshness to any dish. 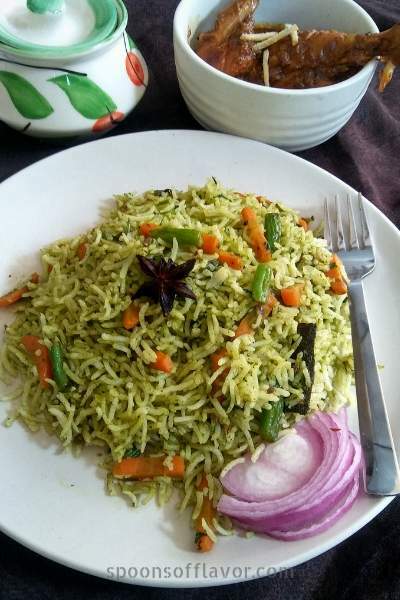 To make this coriander rice, along with coriander leaves I have used few mint leaves here and only carrots and beans are used for vegetables. Green peas, capsicum, corn, cauliflower also go well with this. Also, you can add more veggies of your choice. However, it tastes good without adding any veggies too. Let me know your thoughts about this cilantro rice recipe in the comment section. Also, you can connect with me on Instagram, Facebook, Pinterest, and Twitter. Soak the rice for 30 minutes. Then drain water and set aside. Heat sufficient water by adding salt and oil. Once water starts to boil add rice and cook until rice 90% done. Strain water from rice. Then pour the rice on a plate to completely cools down. Heat oil and ghee in a pan. Add bay leaf, cumin seeds, star anise, cloves, green cardamoms, cinnamon, and cashews together. Stir until you get a nice aroma. Add chopped onion. Saute until the onion turns slightly golden. Add the chopped carrots, and beans. Saute on medium flame for 2 minutes. Now add salt and stir to mix. Cover the lid and cook for 2 minutes. Once done, add the paste and saute until the masala dries out. Add rice and a pinch of salt. Gently stir the rice to mix. Sprinkle a tbsp water. Then cover and cook for 2 minutes more. Add chopped coriander leaves and gently mix. Then remove from flame and serve hot.